With over 300 miles of public coastline, Oregon’s beaches are sure to amaze with their dramatic offshore rock formations and reborn beach towns. This tour will travel along one of the most picturesque driving routes in the country, US HWY 101. We will spend the day exploring breathtaking beaches and viewing stunning coastline vistas. We will depart downtown Portland and head west on the Sunset Highway, Oregon’s first automobile route through the Cascade Mountain Range! On our drive to the coast we’ll leave the city behind and drive through rolling pastures and towering forests of Douglas-Firs. As we drop down from Sunset Highway, we will meander through a lush Sitka spruce forest to find our first glimpse of the Oregon Coastline at Ecola State Park. Nestled between Seaside and Cannon Beach, the area was once traversed by William Clark himself along with 12 members of his team in search of a beached whale. If time allows, we may also travel back through the forest to Indian beach. Leaving the park, we will make a quick jaunt to nearby Cannon Beach, punctuated spectacularly by Haystack Rock, a sea stack just off the shore made famous by its resemblance to its namesake. Here we’ll explore the beach, watch beautiful birds circle the rock, and if we’re lucky and the tide is out, we’ll view many species of marine wildlife in their natural tide pool habitat. The town of Cannon Beach will be the backdrop of our lunch stop for the day. Guests are able to take their pick of several small-town eateries, each boasting their own eclectic menus. On a sunny day, guests may opt to take lunch to go and enjoy it on a city bench facing the waves! Moving further along our trek, we’ll head south on the famous Pacific Coast Scenic Byway, highway 101, exploring more beautiful coastal shores. Here, our journey will take us to Oswald West State Park, aptly named after the Oregon Governor Oswald West. 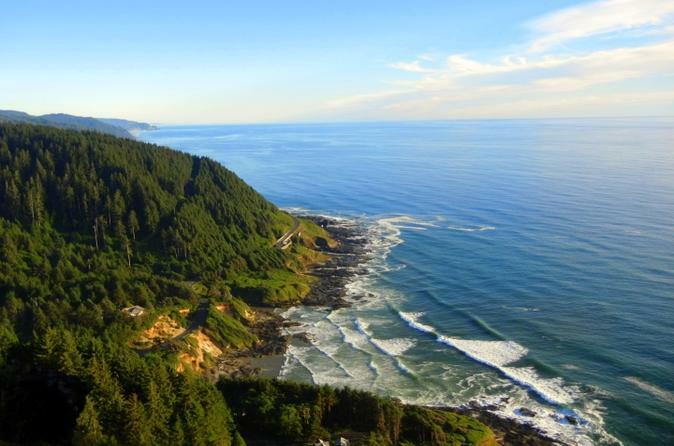 Governor West is credited with ensuring our vast Oregon coastline would remain open for public use. Time dependent, we can opt to take a short, forested hike following along Short Sand Creek which opens to a driftwood stacked coastline known as Smugglers Cove. A variable from this stop would be a short visit to Hug Point. At low tide, we may be able to pop around the point to view a small coastal waterfall! Finishing up at this last stop, we will make the trek back to Portland through Hwy 26 to have you back in downtown just in time for dinner. **Please note: This tour includes several short hikes (.25-.5 miles), loose sand, and/or steps to beach access points.